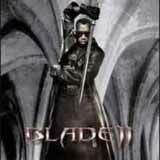 Blade 2 is the only action/adventure combat-fest that allows players to be Blade, the half-vampire, half-human superhero who lives to rid the world of vampires. Armed with an arsenal of deadly weapons and over-the-top martial arts moves, players must stop the vampire underworld from farming humans for their souls by defeating enemies with extreme authority. 360º Combat System: Engage in special hand-to-hand and weapon attacks to destroy hordes of vampires from any direction. Deadly Weapons: Master Blade's use of his titanium-based, silver-plated sword- as well as martial arts moves and modern weapons- to dispatch your enemies. Access Blade's awesome array of high tech weaponry including guns, grenades, stakes, and the boomerang-like glaive. Unholy Rage Powers: Blade's half-vampire abilities give him access to incredible rage powers such as Shield, Sword and Strength, which make him an unstoppable vampire hunter. Gruesome Over-the-Top Kills: Obliterate enemy vampires with spectacular visual effects such as severing body parts, attacks that cause decay and disintegration and staking.